A wise and wonderful 18th-century painter, Chardin, was quoted by a contemporary as saying: "But who told you one paints with colors? One paints with feelings." His own feelings were dispersed throughout every detail, every painted detail, for which he invented colors. A century later, Baudelaire praised Delacroix for his immense range of feeling which, he said, inhabited its own colored atmosphere. M. Delacroix's color, he said, "thinks for itself, independent of the objects it clothes." And a century after Baudelaire, the painter Robert Motherwell, striving to find words to describe the work of his friend Mark Rothko, echoed the poet, saying that Rothko had truly created new color. Coloration, colors, color -- almost totally indefinable, yet familiar to all who are available to the experience of painting. 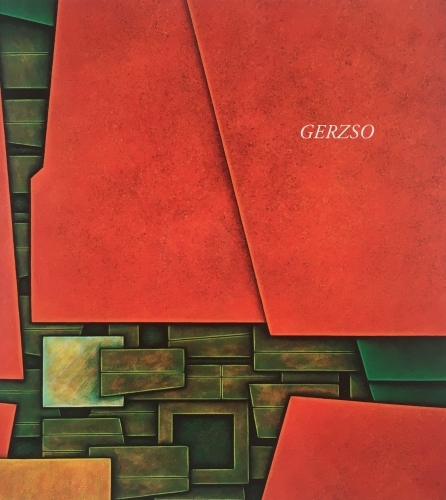 When I think of Gerzso, or rather, when I recall from a distance his oeuvre, I think first of color which I am almost sure is his inmost passion. Every artist has his passion, usually secreted and never paraded in words. Gerzso's passion is for a kind of saturation. He craves the utmost degree, color drenched in itself, thinking for itself, living in its own atmosphere, color that is possessed by him and confined for eternity. Confinement, he has learned produces saturation quite as much as contrast.